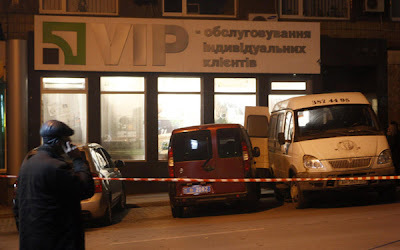 DONETSK, Ukraine -- Five employees of Ukraine’s largest bank, PrivatBank, were killed on Thursday in downtown Donetsk during an armed robbery, with the attackers escaping and fleeing the scene. The attack, which appears to be the worst strike against a commercial bank in Ukraine’s modern history, is the third armed robbery in Donetsk in just four weeks. “We are in deep shock over such a cruel crime,” Oleksandr Dubilet, the head PrivatBank, said in a statement issued by the bank. “The bank's office in the center of Donetsk was robbed by a group of armed criminals in the afternoon on December 29,” PrivatBank said in a statement. “The attackers, in cold blood, killed five bank employees who died of gunshot wounds at the scene." The developments underscore a spectacular failure by police and law enforcement authorities for weeks to contain violence and crime in the city that is known to be the stronghold of President Viktor Yanukovych. Donetsk, which is tightly controlled by Yanukovych allies, is also the home for Ukraine’s wealthiest person, Rinat Akhmetov, whose businesses, ranging from steel and mining, to telecommunications, and finance, are also based in the city. Vasyl Farynnyk, the chief of the main investigation department at the Interior Ministry, told Ukrayinski Novyny news agency that a team of investigators from Kiev had been dispatched to Donetsk to help local police with the investigation. PrivatBank offered a reward of 1 million hryvnias ($123,000) for assistance in uncovering the crime. "PrivatBank declared December 30 a day of mourning for its employees killed at the hands of bandits,” the bank said. “PrivatBank will provide overall assistance to Interior Ministry agencies to investigate all of the circumstances of the tragedy." The latest attack is the third violent attack on a bank in Donetsk over the past four weeks. The previous attack, on a branch of Credit Agricole, a French banking group’s subsidiary in Ukraine, left three people wounded, with one later dying of the wounds. The attackers are believed to have stolen 1.5 million hryvnias ($185,000) - in different currencies - from Credit Agricole. About 11,000 hryvnias ($1,353) were stolen by a group of armed robbers from a commercial bank in Donetsk in early December with no injuries reported.